How Kevin Bacon Cured Cancer – Part 1 from gephi on Vimeo. How Kevin Bacon Cured Cancer – Part 2 from gephi on Vimeo. How Kevin Bacon Cured Cancer – Part 3 from gephi on Vimeo. Please join mm-sing, star blog, or rage! You may have fun and, in the process, your research agenda will start to reflect reality and British taxpayers will finally get value for money. who does her PhD at UCL recounted her experience of using Facebook for rescuing Guy Njike from deportation. Finally, Karin Robinson talked about how she coordinated the activities of the Americans Abroad for Obama campaign. Interestingly, people earned points on the Obama social net website only if they didn’t sit in front of their computers but went out there. These examples of online activism show that social net websites reduce communication and coordination costs and, as such, help people to organize off-line activities as well: people who live in the same neighborhood physically meet for the first time because of shared interests on the Internet (e.g., activism). Those examples also show that there is little merit in Susan Greenfield’s contemptible campaign. Frankly I don’t blame those who think she should go. (from The Economist) Now Scientology is under attack from a group of internet activists known only as Anonymous. 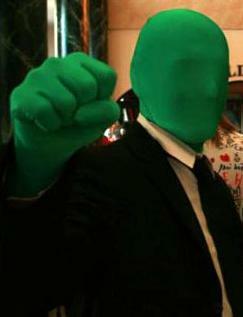 Organised from a Wikipedia-style website (editable by anyone) and through anonymous internet chat rooms, “Project Chanology”, as the initiative is known, presents no easy target for Scientology’s lawyers. It is promoting cyberwarfare techniques normally associated with extortionists, spies and terrorists. Called “distributed denial of service attacks”, these typically involve using networks of infected computers to bombard the target’s websites and servers with bogus requests for data, causing them to crash. Even governments find this troublesome. The campaign against Scientology may all be very well. However, the assumption behind these self-organizing activists is that they are always right (they are anonymous and, as such, they are not accountable). Unfortunately, this assumption does not always hold. Indeed, most of the activities the Mask presented were either jokes the audience failed to understand or Internet bullying activities. Worringly, this self-organizing entity finds it acceptable to launch DoS attacks against websites that happen to disagree with the entity’s views. Is this the right way to go? Can this be even called activism? Susan Greenfield warns everybody (including the House of Lords) about the ‘neurological dangers’ of children using the Internet. Susan heads the Royal Institution and, from her post, influences UK social policy. Alas, she does so based on her own prejudices. Watch her and her mate Dr. Sigman (Dr. Who?) on BBC. Fortunately, an oasis of sanity – responses by Bad Science and Mind Hacks. Those who disagree with you are not necessarily stupid or insane. Nobody needs to be described as silly: let your analysis show that he is. When you express opinions, do not simply make assertions. The aim is not just to tell readers what you think, but to persuade them; if you use arguments, reasoning and evidence, you may succeed. Go easy on the oughts and shoulds. CAT workshop: trust management, web 2.0, privacy, and context. That’s a great possibility to submit work on trust & context management with emphasis on web 2.0 and on privacy protection. Deadline: 13th/20th of March. Submit, submit, submit This call could not be better timed. 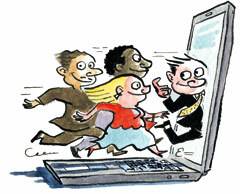 From the Economist: Websites can now let visitors bring along their friends. A NEW button is appearing on some websites. It says “Facebook Connect” and saves visitors from having to fill out yet another tedious registration form, upload another profile picture and memorise another username and password. Instead, visitors can now sign into other sites using their existing identity on Facebook. …The big new idea, says Dave Morin, a Facebook Connect manager, is “dynamic privacy”. It means that, as the social network reaches out across the wider web, users will in theory take their privacy settings with them. Wherever on the web they are, they will be able to choose who among their friends will and won’t see what they are up to. As soon as a user demotes a “friend” from intimate to arm’s-length in his Facebook settings, this will also take effect on other sites. U.S. online video consumers are more likely to view video on weekdays than on the weekend (peak viewing 5:00-8:00 P.M. on weekdays). This opens up some amazing doors when you consider that this slot is adjacent to Television primetime. Wouldn’t advertisers want a multi-channel campaign approach and supplement their TV campaigns with campaign on Internet Video? 80 percent of online video users accepted the presence of advertising as a trade-off for providing free online video content.